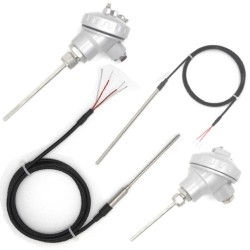 We can offer a wide range of 3 or 4-wire RTD Sensors, suitable for the majority of applications. These can be supplied with various types of probe size and length, fitting types. Cables can be supplied at various lengths and suitable for use in particular applications. Termination can be a standard mini-plug, bare tails or others on request. Please contact us if you wish to discuss your requirements. We have a wide range of compatible Data Loggers and Data Acquisition units, plus software options available.